It’s been way too long since I participated in Celia’s wonderful In My Kitchen series. It’s been going for quite a few years now and is pretty much what it says on the tin, what’s going on in my kitchen this month. Head over to Celia’s blog Fig Jam and Lime Cordial and you can see what is happening in kitchens all around the globe. In my kitchen I have a very exciting new beast and it’s bright red too. I was amazingly lucky to win a KitchenAid recently from Karen over at Lavender and Lovage. It has taken up residence in a corner of my kitchen and it made pizza for me about ten minutes after I took it out of its box. With the leftover pizza dough, I made nine mini rolls, which will be very useful for lunchtimes. I made the dough with half strong wholemeal and half plain white flour with just a little olive oil. All I can say is, pizza dough makes great bread rolls too. In my kitchen I have wild flowers picked from our plot. We haven’t been very good at keeping up with things recently and the flowers have taken over – some people call them weeds. In my kitchen sits a tray of still warm Chinese sweet and salty walnut cookies. It’s a recipe I’ve adapted from The Dumpling Sisters Cookbook, which is due to be published on 11 June. 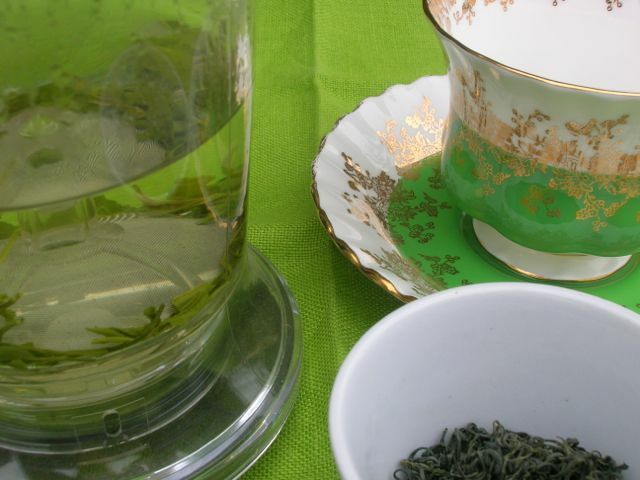 I’ve had a real streak of luck over the last month and have won not just the KitchenAid, but also a selection of really interesting Chinese teas from Janice over at FarmersgirlKitchen. As I type, I am drinking a cup of Lu Shan Yun Wu, which has smokey notes and a distinctive taste hard to describe – I’m already regretting coming to the end of this one. Nut butters are always useful to have and these Pip & Nut butters are some of the best I’ve tasted in a very long time. No nasty ingredients, just the nuts and a little salt. These three pots were the third blogging win I had in as many weeks. They came via Tina from The Worktop. Two days ago, I made my annual batch of rose syrup from the only rose my bush managed to produce this year. I’m hoping I’ll get lucky and one or two more might make an appearance later in the year, but meanwhile this is a good way to remember its beautiful colour and scent. It’s already been used as a cordial and in this morning’s berry smoothie – I fear it won’t last long. My previous In My Kitchen posts – all three of them! I think I would like to be in your kitchen at the moment! Wow, what a lucky month you’ve had, I have a kitchen aid mixer too and love it. The nut butters sound really interesting, I will have to look out for those as I like using different ones. And, home made rose syrup!! Sounds heavenly, does it smell amazing? Oh really Kath? Bother. Too late to get one now 😉 The tea set consists of that one cup and saucer that I found in a charity shop a couple of years ago, it’s gorgeous. Love the red KitchenAid! Would adore one of those if I had a bigger kitchen! Yes Becca, I too have a small kitchen and finding somewhere to put it has proved somewhat problematic. Many congratulations on your wins. I am sure you are going to enjoy using your kitchen aid. I would love some of your luck to rub off on me – you sound like you are on a winning streak – time for a lotto ticket (ha ha). My mum tells me how her stand mixer is great with mixing up her sourdough bread at night and saves her kneading and messy benches – your rolls look beautiful. Your rose syrup is a gorgeous colour and I love your flowers too. I have a KitchenAid mixer too, but have hardly used it as there is never enough space in our kitchens. I am hoping to use it this weekend. So pleased you have your own, and yes its certainly bright and shiny. Thanks Shaheen. I too have a kitchen space problem and had to do a major reshuffle to try and find somewhere for it to live. I can’t use it in situ which is a bit annoying, but I’m still looking forward to making things I couldn’t before – marshmallows for instance. I’d love to have that kitchen aid – it would match my kettle! Hope you enjoy such a wonderful prize. Pretty flowers too – mot definitely not weeds! A red kettle is next on my list Ceri and a red toaster too 🙂 I love the flowers, but they do make it rather difficult to grow vegetables. I am dying to try that Pip & Nut range. Off to buy some next week! I love my Kitchen Aid and I also have a Kmix for my cookery lessons. I would find it hard to choose which I prefer but I think KAid wins on aesthetics! Great that you have two stand mixes Laura, the best of both worlds. It’s a whole new world to me, but the KAid certainly made a good job of my bread. The nut butters are well worth trying. I had a dough hook for my KitchenAid but managed to snap it with a particularly large batch of dough. Love the colour of your rose syrup. Oh no Anne, the dough hook looks quite sturdy, but sounds like I’d better be careful. Did you manage to get a replacement? I only have one rose in my garden and luckily it is a deep red scented one, so I get to enjoy a well flavoured beautifully coloured syrup. What a fun and interesting kitchen. I love posts like this. Wee sneaky peeks! Oh, what a glorious thing to have in your kitchen! That red KA, I mean! Well done. I love your flowers too! Thanks for the peek into your kitchen! We will be in the Cornwall region in the not too distant future! Absolutely glorious Liz. I don’t know how much of a whirl wind tour you are on and whether timings fit in, but it would be lovely to meet you if at all possible. Blimey! You are definitely on a winning streak!!! Well done…..
You’ll love that KA….. they are so powerful and well made!! Choclette, what a fabulous winning streak you’ve been on! That red mixer is a gem. So are your jewel-toned wildflowers and rose syrup… so beautiful. Lots going on in your kitchen at the moment. have have massive Kitchen Aid envy now – enjoy! Well you can see how organised I am Laura – 4 posts in 4 years! But I do always intend to take part. It’s fun. Fabulous kitchen roundup – as everyone has said what an amazing prize, well done! Well done again on winning the kitchen aid! What a fab prize. Your rose syrup looks amazing, look forward to seeing how you made it. Thank you Lucy. The rose syrup is dead easy. I’ve written a how to already, but might do a more up to date one. it’s incredible stuff. What glorious baked goodies! Such a good month for IMK!